Example 1. In these example setups, three independent RAPU's are controlling several different device types. 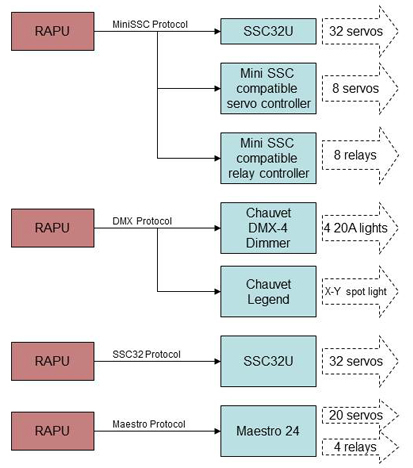 As many as 64 devices (128 DMX devices) may be controlled from a single RAPU. The RAPU itself may be controlled by the onboard LCD and pushbuttons, the IR remote control, or an external RS232 device (such as an Arduino or custom microprocessor). Only one of the RAPU's output ports (serial, DMX, or TTL) may be used at any one time. Example 2. In this example, the RAPU is acting as a repeater. VSA is sending the commands and is controlling 16 MiniSSC-compatible servos, 4 DMX 20-Amp stage lights, and 1 DMX X-Y scanning spot light. Using the RAPU as a repeater allows legacy serial devices to be connected via USB and enables DMX device control.